It's a sad day for online activists in Bangladesh. On Tuesday morning, science writer and blogger Ananta Bijoy Das was murdered by a group of three or four masked people wielding machetes in Sylhet, Bangladesh's fifth largest city. It was the third such killing this year of a writer who advocated secular thought, allegedly at the hands of religious extremists. Das, 33, was a banker by profession but also edited a quarterly magazine called Jukti (Logic) and headed the Sylhet-based Science and Rationalist Council. He was the author of four books on science and critical thinking, and took an active part in the Ganajagaran Mancha, a forum born out of the Shahbag protests that demands a ban on Islamist parties and the death penalty for convicted war criminals. Das was also an admin for the Bangla blog Mukto Mona (Free Thinkers), which won Deutsche Welle's prestigious BOBS award for social change in April 2015. While most of Das's output for Mukto-Mona focused on science and evolution, he wrote a number of blogs that criticised some aspects of Islam and also of Hinduism. In comments on Facebook posted early Tuesday, Das slammed the local member of parliament from the ruling Awami League party for criticising one of the country's top secular and science fiction writers. Bangladesh, a Muslim-majority country, is officially secular. But people who have challenged religion have repeatedly been targeted by Islamic extremists in the past decade. On March 30, another blogger who opposed irrational religious belief, Washiqur Rahman, was hacked to death in Dhaka. Two madrassa (Islamic religious school) students were apprehended and a third assailant got away. Both Roy and Rahman's cases are under trial. Das had been on extremists’ hit list for some time and was first named in a list of 84 bloggers deemed atheist or blasphemous by Islamic hardliners submitted to the government in 2013. AQIS claimed responsibility for Das’s murder, according to tweets by extremist group Ansar Bangla Team. “Another file closed! Stay tuned for next target,” the statement read. I don't have the impetus to write, say or think anything. Two years ago a list of 84 bloggers was submitted to the Ministry of Home, 9th from the list was murdered today in Sylhet. This list is not exhaustive, surely more names have been added in the past two years. But nobody bothered to think about the safety of these 84 individuals. They are ending up dead one by one, in regular intervals. Now they are killing one every month, maybe they will speed up to do the same weekly. This list will be done, thousands more will be added. People will regret the death a bit, hush, silence everywhere, demonic joy from some perverts, then everybody waits for the next kill. In this country all these illegal killings have been taken for granted, every death is an isolated incident. #Rajibhaidar #AvijitRoy #Wasiqurbabu #AnantaBijoy The list is getting longer and longer. We will fight till one of us alive. The International Humanist and Ethical Union (IHEU) wrote in a blog that Ananta Bijoy Das's application for a visa to travel to Sweden, under invitation from Swedish PEN to speak in a conference, was rejected recently by the Swedish embassy in Dhaka, on the basis that he might seek to remain in Sweden. Bangladesh government is not taking any action against the Islamist-killers for being afraid to be labelled as anti-Islam. Islamists are allowed to do whatever they like in Bangladesh. It seems killing free-thinker atheists who criticize Islam is their main agenda. Tomorrow maybe you. Or maybe me. What the responsibility of the police is at this point is a question mark. They could not find the killers of Avijit Roy. 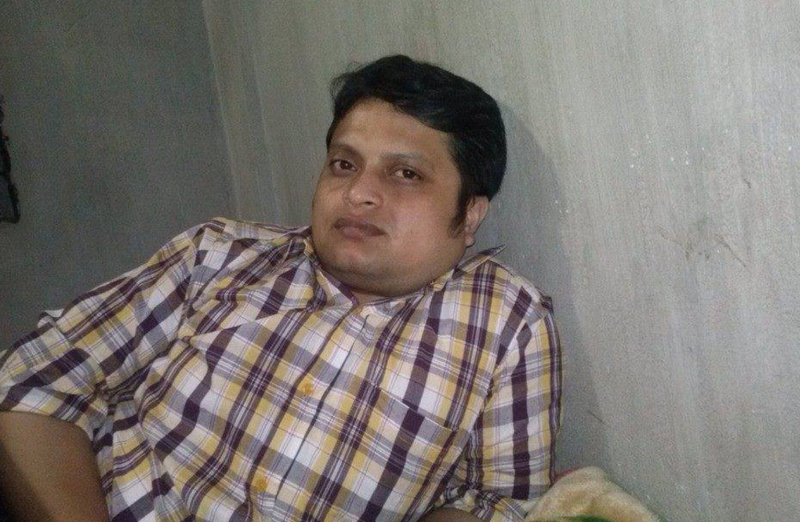 They have arrested the killers of blogger Rajib, but the mastermind is on the loose. It is a tough to hope that the killers of Ananta Bijoy will be nabbed anytime soon or a trial will start. Our prerogative is to not to stop writing even if confronted by wielding machetes. If we stop writing they will win.